In today’s power plant environment, utilities are much bothered about stator earth fault identification and protection implementation. 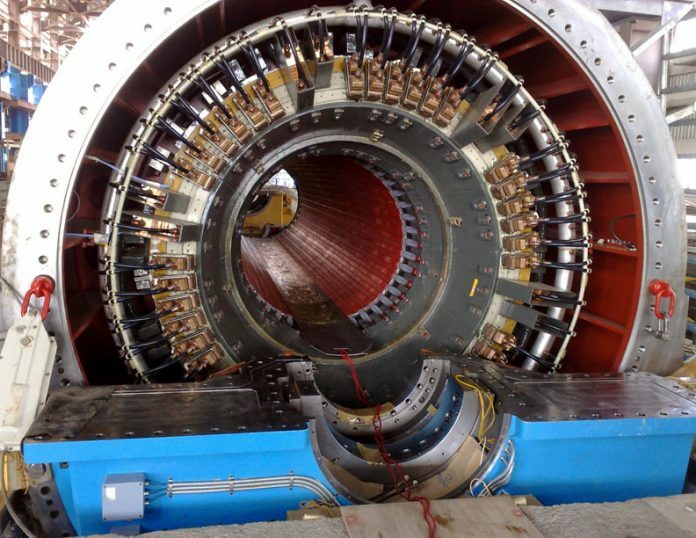 This article will provide information regarding suitability of deploying stator earth fault protection on 3rd Harmonic voltage principle considering the operation philosophy and generator data of some type of machines supplied in past executed projects. However, the actual measurement during commissioning or post-commissioning has to be reviewed for implementing the said protection for any project. It is evident that Earth faults in the final 5 per cent of the winding will result in such a low fault current or such a small imbalance in voltage that conventional protection cannot be relied on to detect the fault. In small sized generators (subject to acceptance by manufacturer) this limitation is accepted due to the low probability of a fault occurring in the 5 per cent of the stator winding closest to the star point, where the voltage to earth is lowest. However, for large generators, 100 per cent stator earth fault protection is commonly specified so as to cover the complete winding against any earth fault. Though such faults close to the star point is very rare and may occur due to small mechanical damage such as creepage of the conductors and loosening of bolts. One proven method is to measure the internally generated third harmonic voltage that appears across the earthing impedance due to the flow of third harmonic currents through the shunt capacitance of the stator windings etc. When a fault occurs in the part of the stator winding nearest the neutral end, the third harmonic voltage drops to near zero, and hence a suitable relay capable of measuring third harmonic voltage with proper filtering technique can be used to detect the condition. Further as the fault location changes and away from the neutral end, the drop in third harmonic voltage from healthy conditions becomes less and it becomes difficult to discriminate between a healthy and a faulty winding. Hence, a conventional earth-fault scheme (known as 95 per cent Stator Earth fault protection) should be used in conjunction with a third harmonic scheme, to provide overlapping cover of the entire stator winding. 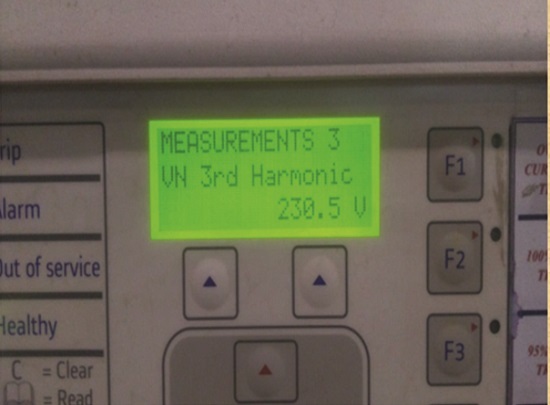 The measurement of third harmonic voltage can be taken either from a star-point VT/NGT or the generator line VT. If the third harmonic voltage is measured at the generator star point i.e secondary of star point PT or NGT, an under-voltage characteristic is used whereas an overvoltage characteristic is used if the measurement is taken from the generator line VT. For effective application of this form of protection, there should be third harmonic voltage of the order of 1 per cent across the generator neutral earthing impedance under all operating conditions. In case the level of third harmonic voltage generated is low (i.e below the set value available in the relay) when generator output is low, the operation of relay can be inhibited using an overcurrent or power elements (kW, kVAr or kVA) and internal programmable logic. Most generators will produce third harmonic voltage to some degree (of the order of 1 per cent of rated voltage at no load) due to non-linearities in the magnetic circuit of the generator design. Under normal operating conditions, the distribution of the third harmonic voltage along the stator windings corresponds to Figure 1a. The maxima occur at the star point N and the terminal T. The value of 3rd Harmonic voltage increases with generator load. For a stator earth fault at the star point, Figure 1b, the amplitude of the third harmonic in the voltage at the terminals is approximately doubled or more both when the generator is off load prior to the fault (VT1’) and when it is fully loaded (VT2’). Also, the third harmonic voltage is reduced to zero when measured at the star point of the generator at NGT secondary. 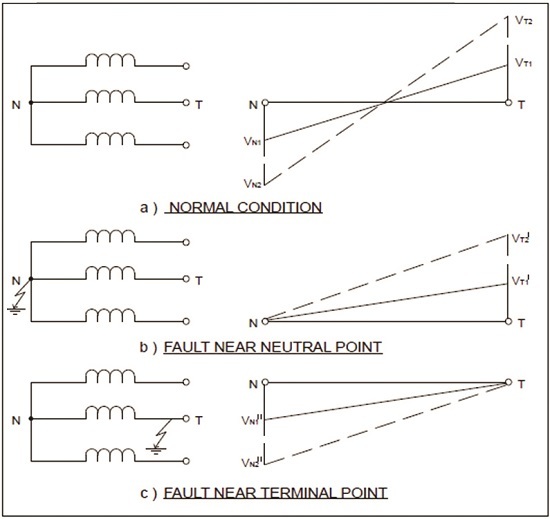 On the contrary when fault is at Generator terminal (refer Fig 1c) the third harmonic voltage at the terminal is reduced to zero and at neutral it will be measured approximately doubled or more. To detect faults in the last 5 per cent of the generator winding, we should provide a third harmonic under voltage at neutral or a third harmonic overvoltage at phase side. We preferably opt to measure the reduction in third harmonic voltage at neutral by deploying under-voltage element which is capable of filtering the fundamental component and thus, providing the accurate and desired results. Data captured during testing of generators of two past executed projects is shown below for ready reference. 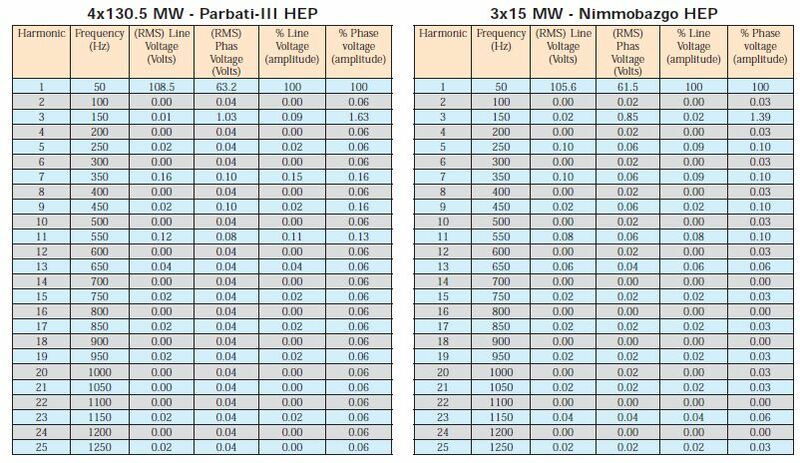 It is noted from the test results that the 3rd Harmonic voltage generated at no-load (independent Generator alone) is of the order of 1.63 per cent of rated voltage for 130.5MW Generator at Parbati-3 and 1.39 per cent of rated voltage for 15MW Generator at Nimmo Bazgo. As stated earlier that 3rd Harmonic currents being generated through the shunt capacitance of the winding is primarily responsible for the generated 3rd Harmonic voltages when machine is tested at no load. In practical the machine when placed in the system shall have more influencing parameters like capacitance of the busduct to ground, load at the consumer end, system parameters etc. Hence, in actual after considering all these practical aspects, the measured 3rd harmonic voltage will be more than what we measure during factory testing of generator at no-load. 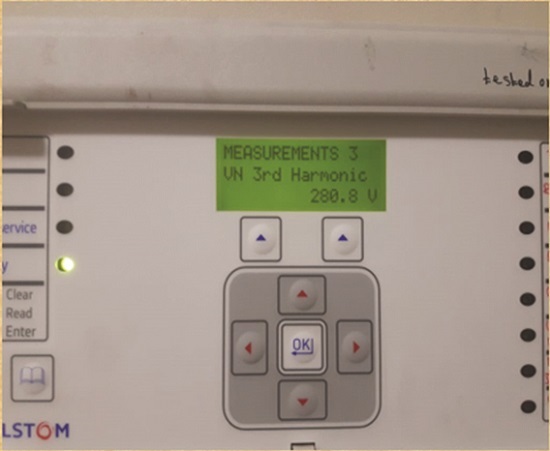 To have more insight on the actual values of 3rd Harmonic voltage generated, we have obtained measurements from our running machines at 3*110MW Kishanganga HEP and 4*40 MW Teesta HEP and are shown below. Above study reveals that 3rd Harmonic voltage generation is prime criterion to deploy the 100 per cent Stator Earth fault protection. Due to definite non-linearities in magnetic design of Generators, 3rd harmonic voltage will surely be generated and will increase with the loading of machine. Practically, our various machines at different site are already commissioned with the 100 per cent Stator Earth fault protection on 3rd Harmonic voltage measurement principle. Hence, 3rd Harmonic voltage measurement principle for 100 per cent Stator Earth Fault Protection can be relied upon and safely deployed. On the other hand, if it is desired to have 100 per cent Stator Earth Fault protection when the machine is standstill, it is user’s requirement to go for external injection principle which is having cost implication and supplier can give at extra cost, when asked by user.